← Thursday Travel: Into 2013! So… the big news in the writing world is: MY COPYEDITS ARE IN! Woot! 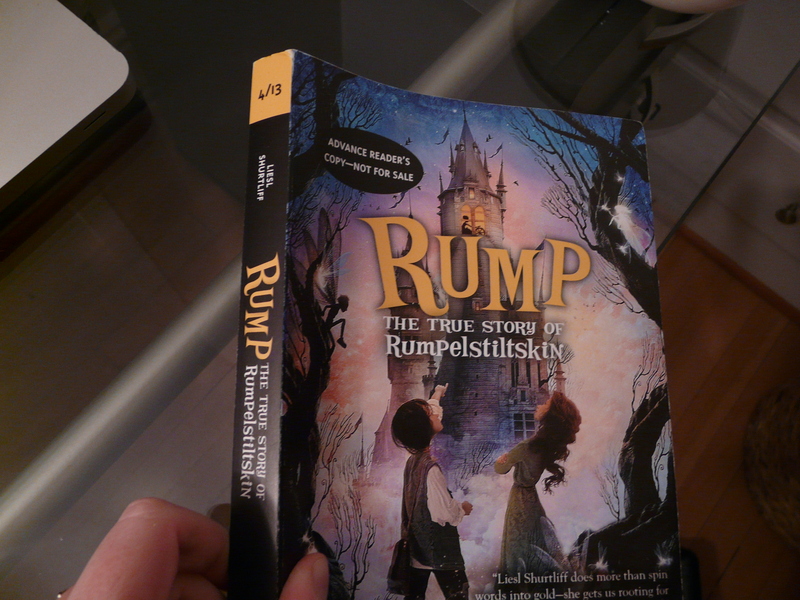 An example of an ARC: Liesl Shurtliff’s RUMP: The True Story of Rumpelstiltskin. Note the “Advanced Reader Copy” sticker and the release month info on the spine. Eep! PS: Liesl is another 2k13 MG-er: go check her out! This means that there are only a few tweaks left before I’m holding shiny new ARCs (Advanced Reader Copies or “galleys”) in my hands!! (For those who don’t know, ARCs are essentially paperback versions of the book, with no bar code. They are uncorrected proofs that are used for marketing purposes.) I cannot WAIT to get them. So, my writing tip for the day (brace yourselves, it’s brutal): When you get to the point of copyedits READ YOUR BOOK OUT LOUD. In all seriousness though, do it. And use contractions the first time because you will regret having to go through 250 pages changing every “it is” and “we are” to “it’s” and “we’re.” Happy writing everyone! P.S. VERY EXCITING! Tune in next week to see my COVER!!! Yes, yes, my awesome cover is heading out into the world on iceybooks next Tuesday, and next Wednesday you can come here to hear all about how the cover reveal went! 3 Responses to Wednesday Writing: Copyedits! So excited to see your cover! Awesome advice about reading aloud. I agree. I read books aloud to my kids and husband – whether they’re MG, YA, or Adult, and I find that when dialogue is… off? I end up rewording it anyway. I just got mine, too! !